‘Multi-tasking Writ Large’: Is American Health Care Reform a Prescription for Trouble? Using two decades of data, Wharton health care professors Lawton R. Burns and Mark V. Pauly recently dissected the cost-cutting component of the Affordable Health Care Act, also known as Obamacare. While the title of their research paper, published in Health Affairs, was "Accountable Care Organizations May Have Difficulty Avoiding the Failures of Integrated Delivery Networks of the 1990s," the authors had offered another, shorter title: "Doomed to Fail?" Burns and Pauly have teamed up before. In 2002, they analyzed health care initiatives in President Clinton's first administration that failed to become law. Subsequent books and articles looked at integrated delivery networks (IDNs), Clinton-era precursors to Accountable Care Organizations (ACOs). The new article compares current Obamacare ACO delivery models to IDNs in the 1990s in terms of their ability (or inability) to improve health care quality and lower costs. In their day, IDNs attempted to coordinate physicians, hospitals, disease management programs and care delivery in alternative sites, but in looser arrangements than formal health maintenance organizations. Hospitals bought primary care physicians' practices and formed a variety of joint venture IDNs with doctors in an effort to gain leverage over insurers in negotiations keyed to per capita payments — an actuarially-based fixed fee per registered patient in lieu of fees for each physician service. However, IDNs failed to secure capitated contracts from payers and were unable to convince doctors to change the way they practiced, even when they employed them. IDNs were faulted for rewarding the volume of medical treatment rather than results, driving costs up with little regard to the quality of patient care. They eventually incurred substantial financial losses and closed down. The Accountable Care Organizations (ACOs) are similar to IDNs in their attempts to integrate care as a way to cut costs and improve quality. The Centers for Medicare and Medicaid Services (CMS) — which serves as the payer for Medicare and Medicaid as well as a clearinghouse for guidance on health care infrastructure — last year released proposed rules for establishing ACOs made up of hospitals, doctors and other health care providers as a blueprint for this coordinated care initiative. Medicare will offer incentive payments to ACOs that are able to improve quality of care while eliminating redundant costs. Burns and Pauly aren't convinced that ACOs are the answer. While their data centers on Medicare, it has implications that apply to the whole health care sector. "In this article, we ask how the current proposals differ from the earlier failed models," Burns and Pauly write in their paper, "and whether any of the differences are large enough to yield better results this time." Their conclusions suggest that the dismal track record of Clinton era IDNs bodes ill for new reforms centered around ACOs. Their research began after Burns accepted an invitation to speak about ACOs to alumni of the Kellogg School at Northwestern University. "I didn't go in with a point of view," Burns says. "I stumbled into it." In January 2011, he was wrapping up an extended focus on India's health care system for a global modular course he taught at the Indian School of Business in Hyderabad,and was not focusing on health care developments in the U.S.
Then, ahead of the Kellogg talk in May 2011, Burns spent three months boning up on ACOs, considered to be linchpins in the argument that government can afford to extend health care to millions of uninsured Americans because it will, at the same time, be able to reap billions of dollars in cost savings. In care coordination, disease management and health information technology, Burns soon realized it was déjà vu all over again. "I began to recognize all these things we had talked about [regarding] the Clinton health care reform" effort, says Burns. The more he looked, the more he saw that Obamacare was relying on money-saving outcomes that hadn't worked in the past. Pauly, adding an economist's perspective to Burns' behaviorist view, agrees with this pessimistic appraisal of the current health care reform initiatives. "So far in the natural evolution of the ACO concept," says Pauly, "it does not seem that it will put pieces together in the right way." He gives two chief reasons. First, the only entities with enough organization, cash and clout to steer health care toward desired ends are hospitals, whose responsibility in general is to treat sick people. Keeping a whole population healthy is an altogether different goal, and requires brand new roles and systems, Pauly says. The second reason looks intractable. For decades, health care has eluded heroic efforts to cut costs. Researchers constantly ask why the market's invisible hand does not demand efficiency in the health sector, as it does in most other sectors that cater to consumers. Hospitals that sought efficiencies in the 1990s seldom reduced costs, in part because physicians operated with separate, sometimes competing agendas. "Nobody has figured out how to get doctors to work and play well with hospitals," Pauly says. Geographic distance between hospitals and doctors' offsite medical groups underscored diverging interests. Burns blames a lack of overall ownership of the health care system. Instead, it is crowded with stakeholders whose divergent interests add up to an administrative puzzle that no one has the power to solve. Health care reform as conceived requires too much from all stakeholders at once, says Burns, a case of "multi-tasking writ large." What's more, half of the money comes from the federal government. "You are not going to have efficient markets," Burns says, "when government is a big payer and the price setter." Until hospital CEOs gain authority to compel all actors in the health care delivery system, doctors included, to behave in a cost efficient manner, Pauly sees little chance for meaningful cost reduction. Experts describe this conundrum as "competing agency costs" and other formal-sounding terms, but Burns adopts a more succinct explanation. "One person's costs are another person's income," Burns says. By that, he means cutting Medicare cost lowers income for doctors, a stubborn dynamic that impedes progress in health care. Other obstacles hamper efforts to lower health care costs. Not-for-profit hospitals lack the drive to keep costs low and profit margins healthy. If a doctor trims hospital costs, he or she seldom enjoys a direct benefit. Consumers lack incentive to police costs so long as Medicare or insurers pick up the tab. Worse, insured consumers usually choose the most expensive option where their health is concerned. To restrain costs, insurers introduced capitation payment in lieu of the traditional fee-for-service model. But that, in turn, may result in an incentive to stint on quality. Insurance companies, meanwhile, lack bargaining power relative to hospitals and doctors. Health reform advocates seek what experts label the "triple aim": improved quality of care, gains in the health of the population at large and reduced cost. But none of it will happen, say Burns and Pauly, if the past is prologue. Their paper enumerates infrastructure features and capabilities for a successful ACO and, one by one, finds them wanting, from physician-hospital alignment and care coordination to disease management, patient-centered medical homes and health information technology. For example, they report lackluster returns on care coordination among multiple providers. In 2002, the CMS funded 15 demonstrations of care coordination for Medicare populations. Only three sites reduced patient cost and admissions, and even at those sites, Medicare recorded no net savings after factoring in added fees for care coordination. Only one program is still active today. "Evaluators concluded that care coordination alone 'holds little promise of reducing total Medicare expenditures for beneficiaries with chronic illness,'" the authors report. And, notably, patients with chronic illnesses consume a whopping share of health care dollars. What about "disease management," a hot topic in medical cost containment? "Net program benefits — in terms of health or money — have remained elusive," Pauly and Burns write. "The Congressional Budget Office found insufficient evidence that disease management programs for Medicare can even pay for themselves." Consider a concept called patient centered medical homes, where teams, led by primary care physicians, supervise comprehensive patient services. Results are mixed, at best. There is evidence that medical homes can "bend the cost trend for a while and address the 'triple aim' [in] dominant, well established care networks with large staffs, strong institutional management and the capacity to manage change," the authors write. But these results are beyond the ability of smaller institutions — those that use the vast majority of medical resources consumed in the U.S. — to reach. Likewise, much touted health information technology, despite quantum advances in capacity and delivery of information since the 1990s, yield less potential than advocates believe. "Overall," Burns and Pauly report, "the evidence suggests that information technology is necessary but insufficient to improve outcomes." Clinical decision support systems are supposed to improve physician decision-making, reduce medical errors and standardize therapy. "Evidence on the benefits of diagnostic assistance offered by electronic systems is mixed," write the authors, "partly because physicians often ignore the systems' advice." Electronic health records have been hailed as a big advance sure to rescue health care. Again, the authors are pessimistic. They see a different bottom line, one with scant evidence that digital record-keeping can cut costs. In fact, employee training and implementation can pile on costs for up to seven years. The same is true for many other elements of accountable care organizations, the authors conclude. Obamacare advertised two big features, Burns says: one, the extension of health insurance to 30 million new people, and two, a plan to pay for them with efficiencies on the delivery side that ACOs are supposed to supply. 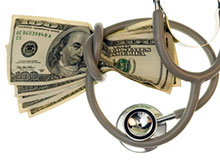 "What our paper shows is that ACOs are not going to save money. They are going to cost a lot of money," Burns states, expressing frustration by what he sees as a failure to consider past experience. "Obamacare will cost a lot more than everybody thinks." Examining "the soft underbelly of Obamacare" exposes looming cost overruns with scarce prospects for improvement in the quality of health care for sick individuals or the population as a whole, he adds. Burns points to the 5% to 10% of Medicare beneficiaries who run up most of the tab or Medicare. "That is where efforts ought to be targeted," he says. "Everybody changing everything invites more upheaval than the system can take."